Hi, we are Jamie and Denise Braddy, otherwise known as Grams and Papa. We purchased our very first RV on May 27, 2015. 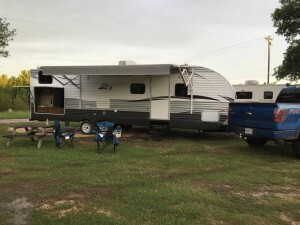 For our first trip we did a one nighter at Pioneer RV park in Bandera, TX that Sat nite, May 30th. It was pretty fun as I tried to figure out how everything worked and trying to remember all the info I was given during the walk through on purchase day. pound plus RV was behind me. We have yet to purchase a weight distribution hitch and Denise felt as if she was getting sea sick…lol. We were right next to the Medina river which was flowing faster than I had ever seen it before. The weekend before we were there, the river had flooded two or three levels of the campgrounds. The park was very clean for just having a flood, except the pool, it was full of muddy water. After we had a lite dinner, we went for a walk down by the river…wow was it ever full and flowing so fast. It was good to see that since it had almost dried up due to the drought we have been in. After our walk, I had a few beers and we just enjoyed each other’s company for the remainder of the night. Once in the bed, we soon found out that one of our first upgrades would be the so called mattress that comes with the RV. I did fine, but Denise’s back was hurting like crazy the next morning. We soon had breakfast and coffee and just enjoyed the morning together. It sure is nice to just get away!! Welcome to RVblogz.com. This is your first post. Edit or delete it, then start blogging! If you need help getting started please review the Help videos or check the Support system for answers. To remove ads from your blog, get more upload space for photos, and access additional features consider upgrading with an RVblogz Supporter subscription. #Gramsnpapasplayhouse is brought to you by RVblogz.com. Get your own free travel blog today! Supporter sites have no ads.